Grace is too easy. That’s what makes it so hard. God soaks us in it, then we are to soak everyone else. Easy peasy. That is until you have to actually do it. On any given day I can let Grace flow. And the very next, dam it up completely. I used to have what I called my “insider trading” conversations going on in my head full-time. Now they’re just part-time, but they still sound the same. I drew these imaginary lines, then made up gunk to stick between them that I rolled between my fingers like play dough to form arrows and barbs and sticks and stones that I used to build my dam. Mental flossing of who deserves grace and who doesn’t, trading grace for favors, bargaining for feel-goods and attention and validation. Sometimes people do things on purpose to hurt. I have scars that prove mean girls are not a figment of our imagination. So maybe withholding Grace made me feel protected. Maybe it was just plain old fear and insecurity. Sadly, when I withheld Grace, I withheld Me. I ignored, discounted, and in my worst moments of insider trading, I spread nastiness all around. In my twisted version of Grace, I was doing you a solid when I withdrew to save you from my venomous attack that you so deserved based on the scenario I had concocted in my head. Say, what? Oh yes. Been there. Done that. Fiction drove my reality. And, at times, I was bitterly lonely because of it. It was this ill-conceived insider trading that strained, and even destroyed, relationships. We all lose when grace doesn’t flow. God’s Grace is so different. God’s Grace has no strings, no trade offs; freely given, never revoked. No matter what I shoulda, woulda, coulda, God’s Grace continues to pour all over me. If I get that concept of Grace, really get it, then everyone would get it. From me. Freely. No strings attached. God’s Grace is mine to turn around and give to everyone. Anyone. I know many of you understand. You have lived it. You live it. You may, even as you read this, be building new dams, creating gunk between the lines you created, rolling that play dough between the tips of your fingers. Blocking yourself off from the might-be’s, from the could-be’s. I’ll be blunt. When we do this, we prostitute our grace, demanding payment before giving the goods. Crude analogy? Perhaps. But Grace is the best thing we have ever been given. Ever. And to not absorb its enormity and share it freely with others is a tragic loss. God’s love is too big for us to grasp. And that makes this free gift of Grace – this undeserved blanket forgiveness – that much harder to get our head around. Yet it is real. And it is available. And we are each only a choice away from taking hold of it. I pray that I choose to be a Grace-giver more often than not. But I will probably always struggle with the sheer wonder of God giving me such an undeserved pass, overlooking my play dough manipulations, my insider trading pathways that lead to such discord. The truth is that it is just too simple for me. I need more rules and regulations, more project management to do. Order and certainty. Yeah, that’s the ticket. Yet there is little of that when it comes to this gift of Grace. Instead, I am learning to see Grace as my own personal roller coaster ride. Thrilling and risky and death-defying and scream-inducing and laughter-provoking. And I want to do it again and again. Grace is amazing because it is so dang amazing. Absolutely loved Phillip Yancey’s book for so many reasons. We tend to use giving someone grace the same way we say “I’ll pray for you” when we don’t agree with them. Thanks for the reminder that God’s grace is so much bigger. Sis – ‘I’ll pray for you’ – another easy one to say but so hard to put the punch behind it that God intended. Even in our gracelessness, we are still given grace… it is amazing! Becky – we certainly don’t get what we deserve, do we? I like to think I’m good at grace. And then I get in an argument with someone (let’s say my spouse, for example) and immediately go to, “yeah, but you…” And I suppose my aggressive driving and road rage contradicts grace, too. *sigh* I make it too hard. We all do, Jen. We all do. Ouch. Now I have to gather up all my cans of play doh… I’m probably overstocked anyway. “Sometimes people do things on purpose to hurt. I have scars that prove that mean girls are not a figment of our imagination. So maybe withholding Grace made me feel protected. Maybe it was just plain old fear and insecurity.” Thank God He doesn’t withhold from us based on worthiness. I’d be in serious trouble. Overstock.com – that’s how much play dough I had on hand! We are all so worthy in his eyes. Grace. Phew! 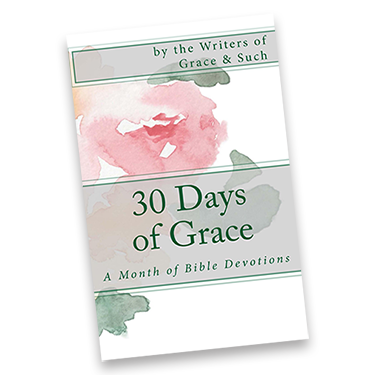 Lots to chew on here, because grace IS so dang amazing & enveloping. Thank you. Gretchen – that’s for sure! Enveloping is a good word to describe it, right? Gretchen – it’s supposed to be easy!! Maybe he wants us to just chew on it so we can digest its awesomeness more fully! I think until recently, I thought of ”outgoing” grace as something that I had control of…like you say..to dispense where appropriate. This is so dang true that when it’s God’s grace – that if we let it – can flow THROUGH us – its way better than any ‘contrived’ grace that we can muster up. Ahhh, to be in the conduit of HIS perfect grace…and when it is on its way to others, it washes over me in the process…love this! !